THE "Hound" designed by the de Havilland Aircraft Co., Ltd., is a general purpose two-seater fighter fitted with a Bristol "Jupiter" Mark VIII. In addition to a bomb ДальшеMore>>> load of approximately 450 lbs. (205 kg.) arranged in various combinations, it carries one Vickers machine gun for the pilot and one Lewis machine gun mounted on a special D.H ring for the gunner. Fuselage. - This is of three-ply construction with spruce longerons and web members. To the rear of the engine a large compartment is arranged to carry desert equipment, etc. Two petrol tanks of 74 and 52 galls, capacity are fitted inside the fuselage, between the planes. Fuel from these feeds a 20 gall, gravity tank in the centre section by means of a windmill driven D.H. pump. The pilot is situated where his view is good in all directions, and the gunner, whose cockpit is also fitted with complete controls, has been placed immediately behind and can communicate with him without difficulty. The gunner's cockpit extends along the rear fuselage giving an excellent prone position for bombing and ample accommodation for the full military equipment. Wings. 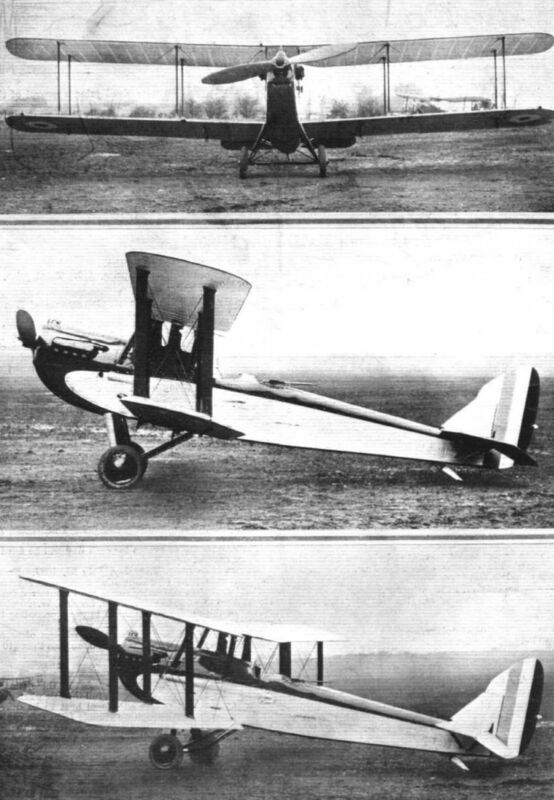 - Arranged in the form of a two-bay equal-span biplane, the wings have duralumin oval tubular spars, and steel tubular interplane and drag struts. The secondary structure, i.e., ribs, etc. are of spruce. Four ailerons are fitted and are operated by the D.H. differential control. Engine Installation. - The Bristol "Jupiter” Mark VIII engine is mounted on a duralumin plate; this is connected to the front fuselage by a steel tubular mounting. An oil tank carrying an oil-cooler is fitted above this structure and forms part of the cowling. Undercarriage. - This unit is of the split-axle type giving a wide track and ample ground clearance. It makes it possible to carry a torpedo or one heavy bomb mounted under the fuselage. The shock absorber legs are fitted with streamline rubber compression blocks encased in a duralumin fairing. De Havilland "Hound" (Napier "Lion"). Another "General Purpose" machine, also fitted with the Napier "Lion" engine. Although an obvious De Havilland product the "Hound" represents several departures, and particularly should its clean lines be noted. So good are these that the performance of the "Hound" is quite exceptionally good. In fact, it has been jestingly remarked that the performance is "too good" for a machine of this type. There is nothing exceptional in the general design, no startling changes in arrangement. The high performance is simply due to careful avoidance of interference effects as far as possible. A RECORD BREAKER: The De Havilland "Hound'' having its Napier Series XI engine warmed up before the record flight. 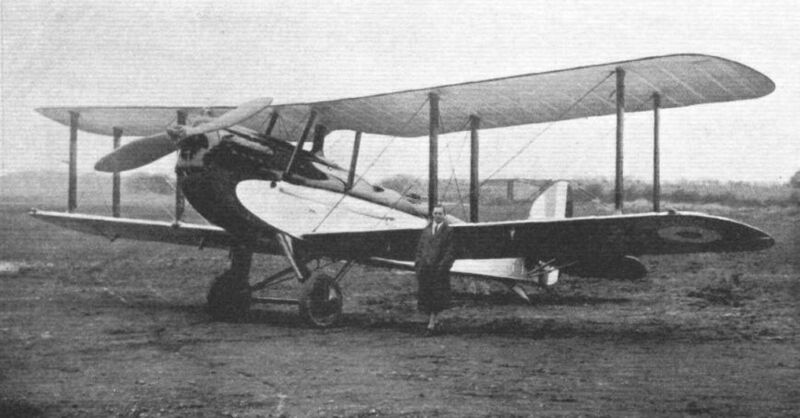 THE DE HAVILLAND "HOUND": This machine has been said to be "too good" for a General-Purpose type, and may be transferred to a different class. Performance figures may not be given, but the "Hound" is believed to have excellent speed, climb and ceiling. The engine is a Napier "Lion." 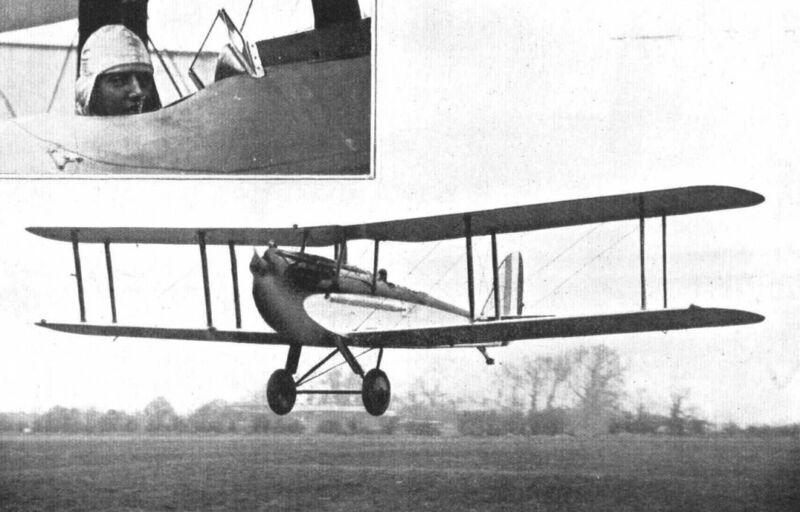 THE DE HAVILLAND "HOUND" IN ACTION: Two photographs of a new D.H. with Napier "Lion." When the photographs were taken the machine was piloted by Capt. Hubert Broad. Capt. Broad in the cockpit.